Imagine if the popular (the reason for its popularity remains a mystery to me) television show “Swamp People” had their DNA mixed in some “Jurassic Park” type sequel with the Jedi Knights and their snow speeders from the “Star Wars” franchise. The resulting offspring would probably look a whole lot like the Soviet WWII era aerosan family of light vehicles. While Soviet designers didn’t have to worry too much about Death Stars and their ilk they were faced with finding a way to move quickly and efficiently across the frozen and snowy steppes of Mother Russia during the deep winters. 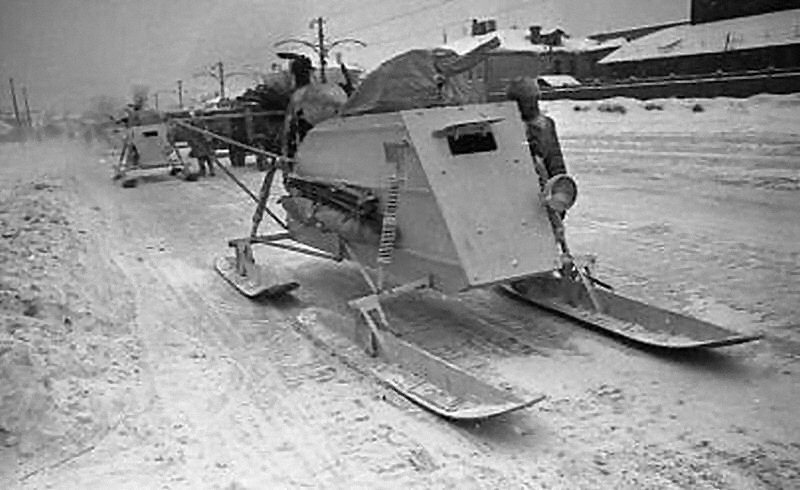 The aerosan, a kind of propeller driven snow cat, had been in use prior to the war, and various types and styles were impressed into service during the Winter War with Finland and during the first winter of the German invasion. Following their limited success the call went out to Soviet industry for a more organized effort behind a purpose built family of vehicles. One result of this effort was the NKL-26 armored aerosan which Trumpeter Models out of China has created and released in 1/35 scale. This particular vehicle, the NKL-26, was used for reconnaissance and raiding purposes. It carried a crew of two; a driver and a commander/gunner who operated the ring mounted light machine gun in the roof. 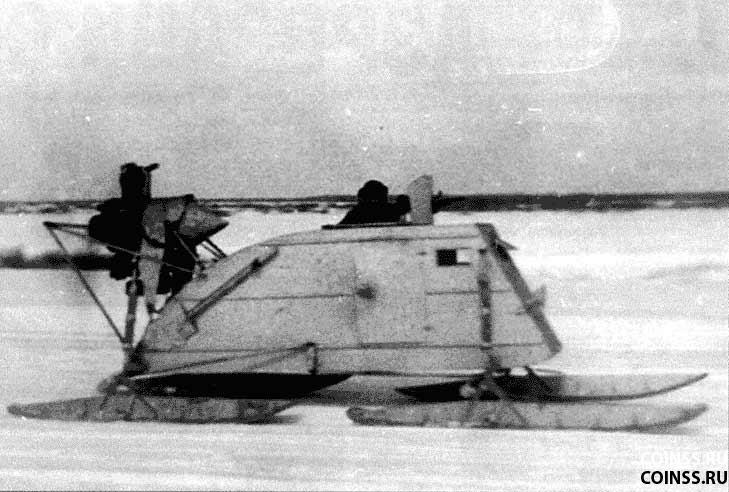 The vehicle was also capable of towing, or carrying by clinging to the vehicle skis, a complement of up to four ski troops. Trumpeter has packaged the kit in a smaller sized, 26cm x 16cm, two piece box that is further divided up into two inside compartments. The kit consists of 8 sprues of light gray plastic plus the main body of the vehicle which is separate, two frets of photo-etched material, one smallish decal sheet, a clear acetate sheet for the glass windows, a full color painting guide, an advertisement sheet announcing upcoming releases, and a 12 page instruction guide divided into 11 sections. The box size is nice for storage ease as compared to some other manufacturers who put smaller vehicles into boxes that are essentially the same size that they use for a King Tiger model. All the parts appear very cleanly molded with no evidence of flash on any of the parts in my sample. There is some molding seams that will need a bit of clean up but nothing that a quick pass with a hobby knife or chunk of sandpaper can’t cure. There are a very few knockout pin marks that may need to be dealt with, the back of the driver’s seat has a couple as well as the floor of the interior and the inside face of the armored glacis plate. If you place the commander figure in place at the machine gun however, and close the single door you won’t have to deal with any of that. The kit boasts 230 parts, the bulk of which fall into one of two categories. The first is the excellent M-11G aircraft engine that powered this guy. I’m not really an engine kind of guy; (you can ask my brother, a veteran mechanic if you don’t believe me) so I don’t know just how accurate the kit engine is. However, I can tell you that it looks sufficiently busy for an aircraft engine, the cooling gills on the cylinders appear first rate, and there are a goodly number of smaller fittings that help tie the whole thing together. I can’t vouch for the dimensionality of the large metal clad propeller that moves the whole thing, but again what is provided is very well detailed with nicely simulated small bolt detail on the metal leading edges. The second area of the kit that requires a large number of parts are the four large skis (skids?). Each of these is built using twenty pieces, mostly photo-etched braces, leaving you with a very finely detailed set of skis. Again, like the engine and propeller, the overall detail, and the bolts in particular, are very well done and should paint up very nicely. There is a rudimentary interior that consists of the driver’s station with seat, instrument panel, and steering wheel, as well as commanders station (it appears to be simply a storage box to stand on) and a gas tank. Of course, the real deal may have had little more than that in truth. You may want to add a few items, first aid kit, spare ammo, foot pedals, etc, if you display yours with an open door or no commander figure. The exterior, excluding the skids and the engine, is pretty plain as you might expect from a vehicle that was essentially constructed from sheets of plywood. Some photo-etched brackets, the requisite struts for the skids, single headlamp, door and armored visor, and that’s pretty much it. On board equipment consists of a shovel with PE bracket and clamp and a spare propeller, which has got to be the largest piece of standard issue kit for any model anywhere. It also is attached with a couple of PE straps that hold it all down tight. Finally, you do get one figure. It is the commander gunner and he is posed in a firing position. I haven’t put him together so I am not sure how well he will fit with the machine gun in place which takes up about two-thirds of the hatch opening. The MG itself is nicely detailed, perhaps not up to the level of Gen2 equipment but certainly serviceable. With all that being said it does appear that the model has some dimensional errors. When I compare pictures from the web (thank you Wikipedia!) it becomes clear that things are off just a bit. The struts attach in the wrong spot, they should be above the side windows not below as they are modeled. I would guess that throws some of the basic angles off as well. How could they make such a mistake? Well, I may have an answer. I don’t have any newer reference material beyond what is available on the web (try Russian Battlefield, or my favorite, Engines of the Red Army), but I do have some older pre-web materials. What I generally turn to first is my copy of Steve Zaloga’s “Soviet Tanks and Combat Vehicles of World War Two”, published way back in1984. Inside on page 187 is a three view drawing of the NKL-26 that matches almost perfectly with the kit, errors and all. I wouldn’t fault Steve, lots of new information since 1984 is now available, but I wonder if Trumpeter may have been looking at either the same book, or resin kits that had been made using the book as primary information. Can’t say for sure, but it would answer the ‘how did they get this wrong’ question. At the end of the day, the model still looks like an aerosan NKL-26, even with the dimension issues. It may prove to be a daunting task to reposition the struts into their proper placement without a major reworking of related assemblies if you are so inclined. If these issues are a deal breaker for you stay away from this kit. If, on the other hand, you’re just looking for an inexpensive, well detailed model of something unusual that is fairly accurate this might just be it. Highs: Very inexpensive, nicely detailed, and a highly unusual subject. Lows: Dimensional issues and improper positioning of key components disheartening. Interior lacks some important details. Verdict: It will look good on a shelf! Maybe not entirely accurate, but it should still prove popular. I would be wary of using drawings as a reference. I also checked out 'Engines of the Red Army' as well as other images on Google. Most drawings varied in detail, and even the drawing on 'Engines of the Red Army' varied from the accompanying photos. Those struts for the front skis are mounted higher than Trumpeter made them, but not as high as the drawings show - they're about level with the side windows. And the body shape according to photos are also slightly different from the drawings. If these variations are factual it may be because of different manufacturers, just as Sherman tanks from one foundry had slight differences from those of another manufacturer. BTW, Rick, thanks for pointing out potential errors. I might not have done my own research and was planning to start my model tomorrow. Now I have a chance to see if any corrections can be easily done. Just "issues" ? It looks totally wrong!. It would be better buy the kit for details and scratch the entire body...Worth it the pain? LINK What an address! Look there and you will see there is little difference between Trumpeter and the real thing (with the possible exception of the location of the front ski strut. LINK In this drawing (if you choose to use drawings as reference) it is identical to Trumpeter's version (scroll a bit down). LINK Trumpeter's areosan seems to be based on these final set of plans. It all boils down to which set of plans you want to believe! It's also possible that if more than one company was involved in manufacturing the Aerosan minor differences resulted. Why do we modellers set such stock in plans drawn many decades after the priginal was produced? And who says that the Trumpeter kit is not accurate for a certain percentage of the Aerosans produced? One cannot say that, empirically, that the Aerosans produced in the USSR during their production period were all the same. Don't forget these vehicles were also impressed into service from civilian life and could have differed markedly to each other. If you think it is so bad just don't buy it, but for the rest of us who like having something different in their collection and don't ignore all other drawings other than the ones published in the 'never-wrong' books available out there, we are more than happy to build it. Accurate or not, it's gonna be a unique addition to my WW II display...count me in on buying one! !